To a hero's captured gaze. But death of evil is in doubt. Who once was brave is braver now. Fight the waves from stern to prow. The trio are awakened in the boat by wakes rocking against the vessel, and they quickly discover that they're lost at sea. A curtain of mist falls over the boat and destroys visibility, before eventually the mist lifts and the three find themselves in calmer waters. Looking up ahead, they see what appears to be an island. 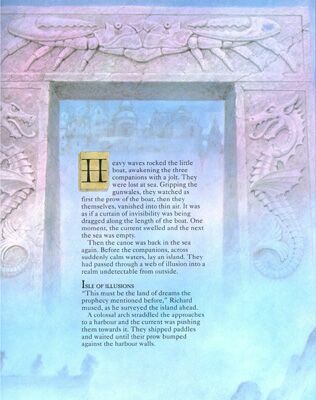 Realizing they had entered the land of dreams as mentioned in the Book of Prophecies, Richard and his friends make their way to the island, passing beneath a massive arch before finding a harbor. Upon reaching the harbor, the trio climb onto shore, noting the ancient lighthouse on the far end of the waterfront and a series of narrow streets that lead to the center of the island. Sensing that something is watching them despite everything appearing deserted, Richard leads Orkan and Melek down a street. He then suddenly hears a flapping sound above and looks up. 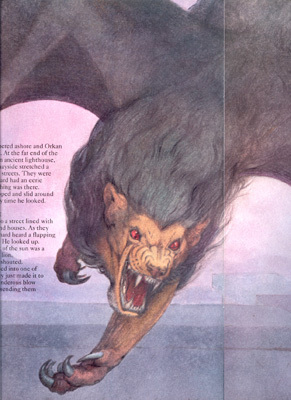 Emerging from the glare of the sun is a monstrous winged lion charging straight towards them, and Richard quickly yells for his friends to run. The three duck inside one of the nearby mansions on the street, moments before the winged lion rams against the house a couple times in an attempt to topple it. 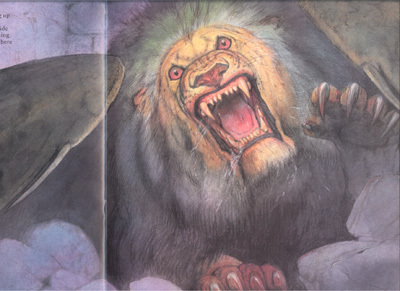 The house remains standing, and the lion tries intead to reach inside the house with one of its giant paws. Richard and his friends huddle out of reach, and eventually the lion gives up, flying away with a loud roar. With the lion gone, the trio huddle together and look at the next verse in the Book of Prophecies. Upon reading the verse, Richard remembers the amulet and how it was meant to heal after crossing water three times. With the crossing of the rivers on Cragmar's Plateau, the waters of Gator's Swamp, and the sea surrounding the island, the amulet has indeed regained its sheen. Concerning the rest of the passage, Richard suggests searching the maze of streets. They exit the house and make sure to maintain good cover in case the lion attacks again. Soon they reach a large door, which they push open to reveal a maze of corridors. Richard uses the amulet to guide them, listening to unspoken directions from Golan, while at the same time he thinks he sees strange shadows dart in and out of view from time to time. Eventually, the three reach a large center arena in the middle of the island town. 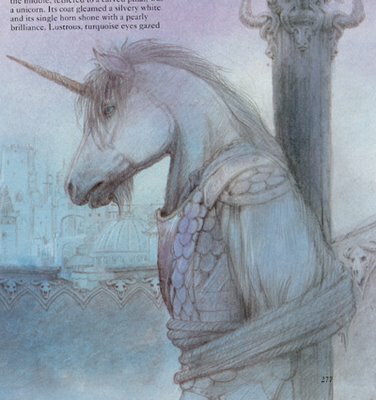 In the middle of the square, tied to a pillar, was a unicorn man, who glances nervously at Richard and his friends. Richard assures the unicorn that they are friends come to rescue him. The unicorn is relieved and reveals himself to be Tuska, Guardian of the Mythical Beasts. Tuska also identifies the winged lion as Kronis, who has taken Tuska's dagger and halberd, the only items which can cut the unicorn's bonds. 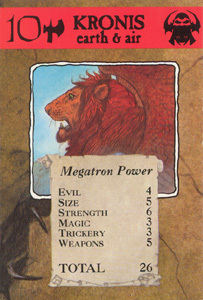 When Richard reveals that they've already encountered the winged lion, Tuska admires the three's escape of Kronis, considering the creature's incredibly poisonous claws. 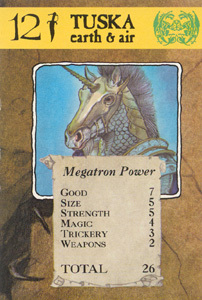 Richard vows to bring back Tuska's weapons, which the unicorn reveals are hidden in Kronis' lair in the harbor's lighthouse. The trio give their farewells and rush to the door to head back to the harbor. They pause when they wonder how they'll return to the square through the village maze, and Richard remembers Melek's rope, which can stretch beyond its length. Tying one end to the door, Richard pulls the rope, which indeed does stretch and snakes its way behind the three as they go back the way they came. After a while of traveling, the trio find themselves at an unrecognizable corridor. Before they could double back, the shadow of Kronis descends upon them from above. In a panic the three run through the maze of corridors before emerging in a dead end. Luckily, the tight space of the passageway prevents Kronis from getting close enough, allowing Richard and Orkan to fight back with their blades. Within moments, Kronis retreats after his paw is sliced by one of the blades. With Kronis gone, the three rush out of the dead end and miraculously find themselves at the entrance of the maze. Without thinking they dash into the nearest building. Richard fears that Melek had dropped the rope in all of the ensuing ruckus with Kronis, meaning they would never find their way back to Tuska, but Melek proudly reveals he had kept the rope the whole time, causing Richard to hug him in elation. With the rope still in their possession, the trio exit the house and make their way towards the harbor, where blood drops indicate Kronis had returned to his lighthouse lair. 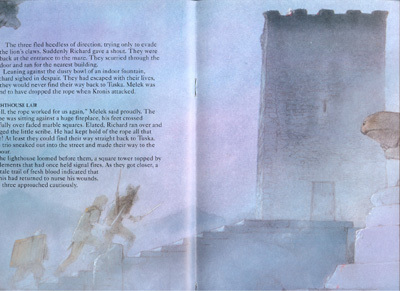 The group reach the lighthouse, where Melek is told to stay put so he won't be in the way. Rirchard and Orkan climb the lighthouse's rail-less stairway to the top floor, where they prepare to enter the winged lion's den. Orkan strings an arrow and Richard draws his dagger, and the two of them burst into the room, where they find Kronis licking his wounds in the corner of the room. Beside him are Tuska's halberd and dagger. Orkan fires several arrows at Kronis, striking the creature's hind leg and right wing joint. Richard then shows true valor and approached the monster to retrieve the weapons despite Kronis' lethal claws. Several slices of his dagger causes Kronis to roar in agony, giving Richard enough time to pick up the weapons and get to s afe distance. As Richard retreats back to the stairwell, Orkan fires several more arrows, striking Kronis' throat and lung. As Richard and Orkan rush down the stairs, Richard notices Kronis pull the arrows from his body and start to crawl after them. The two reach Melek downstairs and begin following the rope back through the maze to the square where Tuska is held captive. Upon reaching Tuska, Richard uses the Guardian's dagger to cut through the ropes, watching them slice through remarkably easily. Richard hands the Guardian his weapons as Orkan reminds them that Kronis is chasing after them. The four run from the arena and use Melek's rope to lead themselves back out of the maze, where the rope returns to its original length. 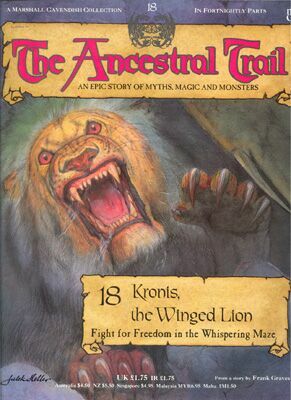 As they approach the lighthouse, where Kronis has finished crawling down the stairs, shadows start to materialize around them and approach the winged lion. Tuska calls out an order, and the shadows quickly engulf Kronis; the monster disappears beneath the cloak of shadows within moments. As Kronis is enveloped, the shadows begin to gain color and shape, and soon Richard can make out the forms of mythical creatures. Tuska senses Richard's awe and explains that these new creatures are his forces, the mythical beasts. They had become shadows after Kronis had imprisoned Tuska, but now they are regaining their original forms upon Kronis' death. With their job complete, Tuska leads the trio down to the shore, where their boat is waiting for them. Tuska bids his new friends goodbye, saying he'll see them again soon. As the three paddle themselves from the island, Richard notices a sea creature regain its form like the land beasts on the island did. As the three push their way through the waters that separate the island from the main land, the sea suddenly turns rough and begin tossing the small craft side to side. Their paddling has little effect on their progress, and minute by minute their boat takes on water. The possibilityt of sinking begins to look very real. Kronis is a monstrous winged lion that serves as one of the Evil One's guards. As a lion, Kronis has the basic arsenal of weaponry - strong muscles, powerful jaw, and sharp claws - but has the added bonus of the ability to secrete poison from his claws, a poison potent enough to kill hundreds of men with a single scratch. Kronis dwells in the lighthouse overlooking the island of the mythical beasts, where he stashes the weapons of the captured Guardian Tuska. The unicorn man Tuska is the Guardian of the Mythical Beasts and the Keeper of the Life Force Pod of Knowledge. When he was captured by the Evil One and imprisoned by the winged lion Kronis, he was tied to a pole in the center of the island of the mythical beasts, bound by a rope that only Tuska's own weapons - a dagger and halberd - can cut through. 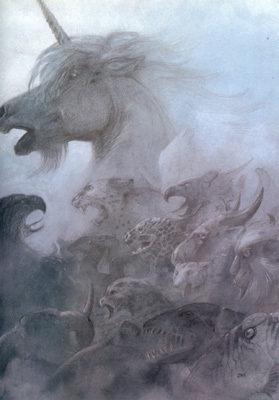 The Mythical Beasts are a race of creatures that dwell within the Ancestral World. While the Common Beasts are composed of creatures found within Richard's world, the Mythical Beasts are composed of beasts that are found in myths and legends. 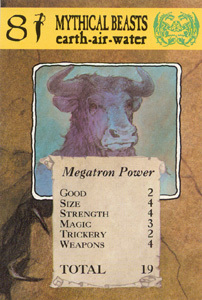 Beasts such as minotaurs, griffins, dragons, and sea leviathans are just some of the Mythical Beasts. When the Guardian Tuska was imprisoned by the Evil One and Kronis, the Mythical Beasts were reduced to mere shadows of themselves, forced to wander their island home. After Kronis' death, they regained their life force. Another issue, another Guardian. As The Ancestral Trail reached the three-fourths mark, the pace begins to pick up concerning the retrieval of the Life Force Pods and the rescue of the Guardians. With the saving of the Guardian Zard in issue sixteen, the finding of a Pod in issue seventeen, and Tuska's rescue in issue eighteen, one begins to wonder why the Evil One decided to clump them so close together like this. Did he think he could properly guard them in this region of the Ancestral World? Evidently his thinking was off, if the incompetence of Cragmar, the weakness of Gator, and the pitifulness of Kronis is to be believed. Also in this issue, the identity of the Pod retrieved from Gator is revealed. 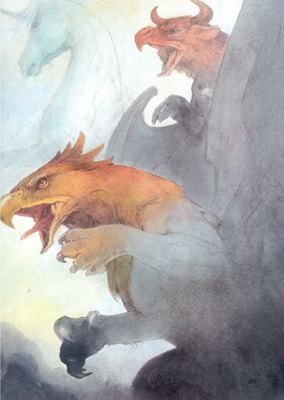 When Richard faces Kronis in the beast's lair, he knows he must claim Tuska's stolen weapons if the Guardian is to be freed and faces the winged lion despite the monster's lethal poison claws. At this moment, "Richard show[s] true valor." The Life Force Pod is therefore the Pod of Valor. Finally, another observation concerning the Ancestral Trail playing cards needs to be made regarding their images. In the playing card for Kronis, the winged lion is depicted as a fiery red monstrosity all over, from hair to skin. In the issue itself, Kronis' coloring is more varied, albeit more dulled, with yellow fur and and a greenish main and bloodshot red eyes. This is yet another example of the discrepancies between the playing card pictures and the issues, but in the next issue the most extreme example of this will be revealed. "The prophecy's right. Regain a treasure its sheen! It's the third time we've crossed the water, and the amulet's back to normal!" Tuska: "I am Tuska, Guardian of the Mythical Beasts. Kronis, the winged lion, made me his prisoner and took my halberd and dagger - only they can cut me free." Orkan: "We've seen Kronis already." 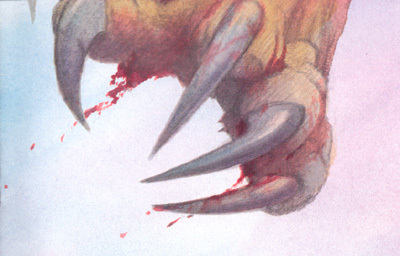 Tuska: "You've done well to escape him then, a single scratch from his claws delivers enough poison to kill an army." Richard: "Did you notice any shadows following us?" Melek: "Yes, some of the shapes looked like the incredible beasts described in Morbane's book." "These are my forced. They are the mythical beasts, the half-believed figments of legend. This is our city, but when Kronis imprisoned me, my forces became mere shadows. They were left with no strength and no power. Yet you can see them filling out even now. When Kronis dies, they will be flesh again."